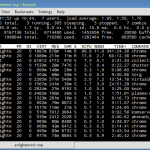 One of the most basic command to monitor processes on Linux is the top command. As the name suggests, it shows the top processes based on certain criterias like cpu usage or memory usage. The processes are listed out in a list with multiple columns for details like process name, pid, user, cpu usage, memory usage. 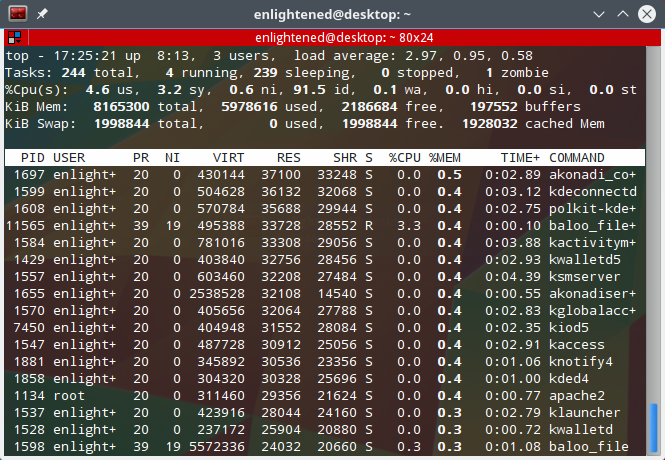 Apart from the list of processes, the top command also shows brief stats about average system load, cpu usage and ram usage on the top. This post shows you some very simple examples of how to use the top command to monitor processes on your linux machine or server. Be aware that the top command comes in various variants and each has a slightly different set of options and method of usage. This post focuses on the top command coming from the procps-ng project. 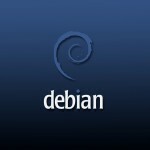 This is the version available on most modern distros like Ubunut, Fedora, CentOS etc. To get a glimpse of the running processes, just run the top command as is without any options like this. The screen contains a lot of information about the system. The header areas include uptime, load average, cpu usage, memory usage data. 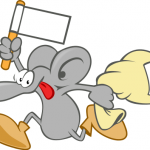 The process list shows all the processes with various process specific details in separate columns. Some of the column names are pretty self explanatory. USER - The system user account running the process. %CPU - CPU usage by the process. 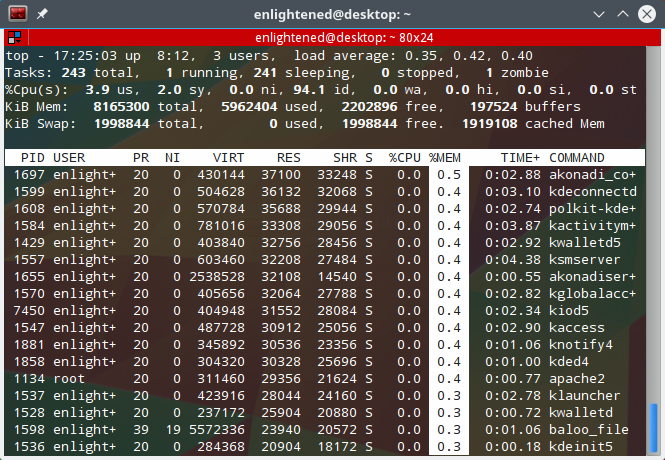 To find the process consuming the most cpu or memory, simply sort the list. Press M key ( yes, in capital, not small ) to sort the process list by memory usage. Processes using the most memory are shown first and rest in order. Press 'P' - to sort the process list by cpu usage. Press 'T' - to sort by the running time. Here is the output sorted in ascending order of cpu usage. Processes consuming the least amount of cpu are shown first. The top command updates the information on the screen every 3.0 seconds by default. This refresh interval can be changed. Press the 'd' key, and top will ask you to enter the time interval between each refresh. You can enter numbers smaller than 1 second as well, like 0.5. Enter the desired interval and hit Enter. You can filter the process list based on various criterias like process name, memory usage, cpu usage etc. Multiple filter criterias can be applied. Then enter a filter like this and hit Enter. Now top will show only those processes whose COMMAND field contains the value apache. Press 'c' to display the full command path along with the commandline arguments in the COMMAND column. To view the processes of a specific user only, press 'u' and then top will ask you to enter the username. Enter the desired username and hit Enter. Press 'i' to toggle the display of idle/sleeping processes. By default all processes are display. The 'l' key would hide the load average information. The 'm' key will hide the memory information. The 't' key would hide the task and cpu information. Hiding the header information area, makes more processes visible in the list. Lets say you want to monitor only few processes based on a certain filter criteria. Press 'n' and enter the number of processes you wish to display. 'd' or <Space> toggles display, 's' sets sort. Use 'q' or <Esc> to end! The fields marked * or bold are the fields that are displayed, in the order in which they appear in this list. The following output displays only PID, USER, CPU, MEMORY and COMMAND columns. Top also supports batch mode output, where it would keep printing information sequentially instead of a single screen. This is useful when you need to log the top output for later analysis of some kind. Here is a simple example that shows the Cpu usage at intervals of 1 second. Each panel can be sorted on a different column. Press 'a' to move through the panels. Each panel can have a different set of fields displayed and different sort columns. 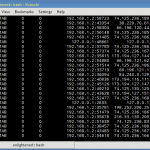 If you are looking for something easier and with a better user interface try htop. 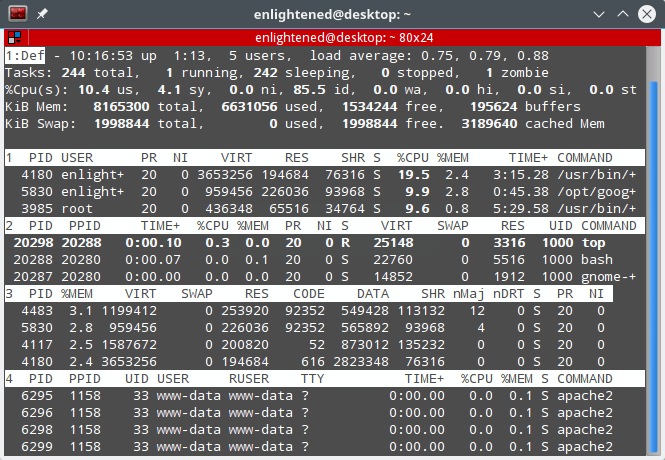 Htop has a intuitive user interface, where you need not memorize keyboard shortcuts. Htop has onscreen instructions that guide you on how to use it. Hi, thanks for the great article but I’m still looking for an answer for my case: It looks like that all the time. CPU load is around 45-50% all the time but if I add up the CPU usage of the services it never gets close… Why’s that? Very helpful..Detail explanation how to use “top” . Very helpful article and learned so many after read.